Credit Suisse has produced gold bars for more than 150 years now. The 1-Ounce Credit Suisse Gold bar and other bullion produced by the company can be traced to the construction of Swiss railroads, when Alfred Escher established the company to finance the expansion of the railroads. Apart from producing Credit Suisse Gold bars, the company expanded into other sectors including its now well-known financial services. Gold bars produced by the Credit Suisse are among the most sought after by investors because it’s easy to store and liquidate them. The gold bar contains 10 Ounces of gold with a fineness of .9999. The bars feature the Credit Suisse stamp, purity level and weight on the front. The back side features the Credit Suisse logo imprinted diagonally in a repeating pattern. 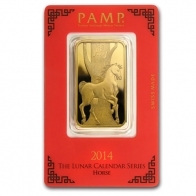 The gold bars are shipped together with an assay card that lists the weight and authentication by the assayer. Valcambi, one of the largest gold manufacturers in the world produces all Credit Suisse gold bars. Investing in physical gold such as large gold bars and coins have shown to be a good protection against inflation throughout history because gold prices have historically gone up as living costs have increased. 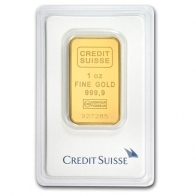 The 10-Oz Credit Suisse Gold gold bar enables investors to invest into a high quality, low premium gold bullion bar that is well known worldwide. The premium incurred in purchasing large gold bars is less than that paid when buying in small quantities, for example, gold coins. Therefore, clients may see a higher return on their investment. Buying Credit Suisse gold bars helps in portfolio diversification. When the value of currency and traditional investments like stocks and bonds start to decline, gold usually moves in the opposite direction. Buying large gold bars also protect investments from geopolitical uncertainty because they retain their value during times if conflict unlike money. Gold has earned the name “crisis commodity” because investors scramble for it when political tensions rise. People who owned large amounts of gold, for example, the 10-Oz Suisse bar benefits from the high prices that are witnessed during a geopolitical crisis. The Credit Suisse gold bar comes with CHI hallmark plus the “Essayeur Fondeur”, which means that the assayer (Valcambi) is recognised by the Swiss government. Credit Suisse gold bars are also LBMA approved. Investors who prefer investing in gold per weight find the 10-Ounce Credit Suisse Gold bar good value for money. 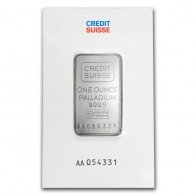 For clients looking to purchase gold bullion in smaller increments, the 1 Ounce Credit Suisse Gold Bar is a good option. 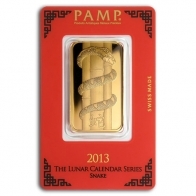 The gold bar design features edges that are sharply defined with a polished surface. Credit Suisse and UBS are the two Swiss financial institutions that have gained a reputation for their high quality precious metals products worldwide. They are the only two banks to have a world following in the gold and silver bars. For clients looking to buy gold bars, the 10 Ounce Credit Suisse gold bar is available for VAT- exempt Swiss storage or for worldwide delivery. Clients selecting Swiss vault storage can benefit from favorable repurchase prices. This option is especially popular for clients looking to hold gold for a limited period, or for those who do not have an adequately safe place to store their bullion.